When I left Vietnam for America thirty years ago, motorbikes, or xe Hondas, were rarities driven only by the privileged few. Frequently breaking down and always needing tune ups, the motorbike’s rumbling sounded out of place in a sea of bicycles. Thirty years later, the motorbike is still an unforgettable image in my mind. My family owned one and my father frequently took us on long trips into the countryside with it. I recall holding onto him as he navigated the switchbacks and hard curves of Da Lat, cool mountain air whipping at us at every turn. When I was eight, he let me grip the massive handlebars of our Honda while it slowly cruised an empty stretch of a city street. The city must have been silent then. The engine’s noise, my shrieks of excitement, and my father’s laughter were perhaps the only sounds on an otherwise empty avenue. 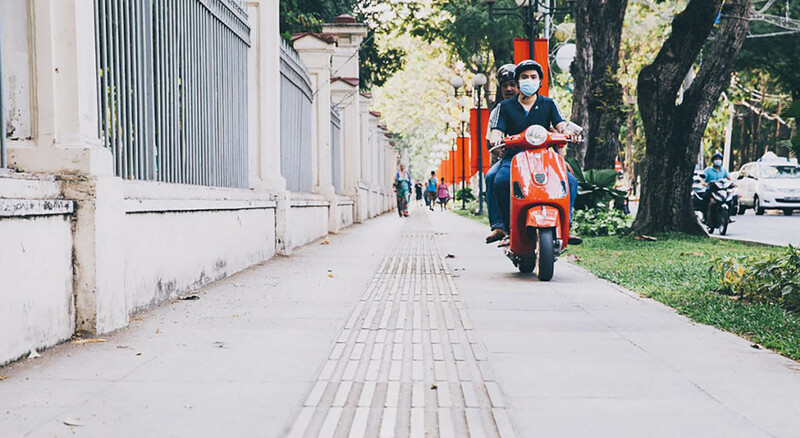 Nowadays, the motorbike’s rumblings are quintessentially Vietnamese. 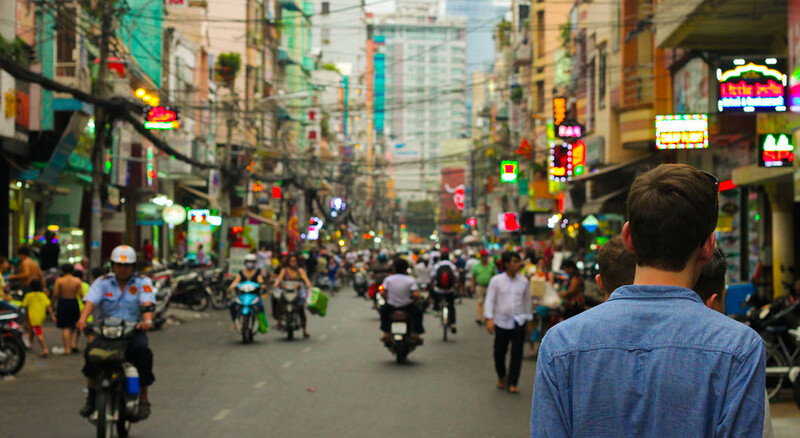 My childhood memories of the silence of Saigon’s streets seem distant and far away. No one ever leaves Saigon without later giving an amusing anecdote about dodging the thousands of motorbikes while crossing the road. 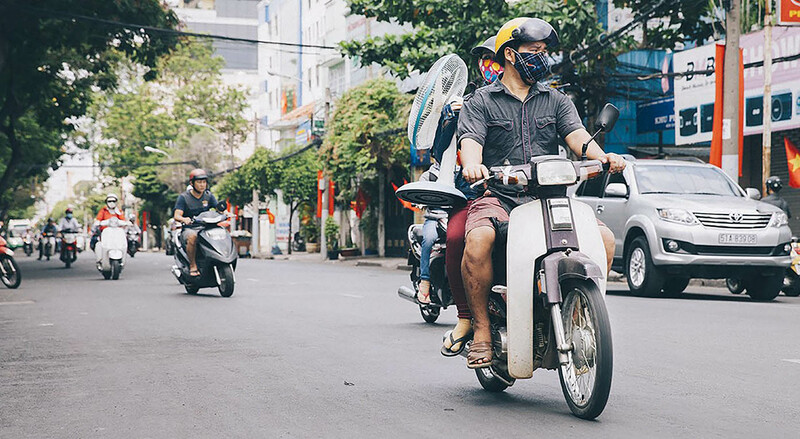 For all its negatives, the motorbike has also become an emblem of Vietnamese hustle. Memes and photos of a dad, mom, and two babies being transported haphazardly on the bike show the reliance of the motorbike by the average Vietnamese. People carry fragile glass windows, ten-high stacks of boxes, or sharp metal beams, scooting on to their destination with no concern. Motorbikes are also fashion accessories. Women use them to get to work, wearing dress shirts and skirts that match their bike colors. Their upright postures are often reminiscent of equestrian champions. At night, the motorbike evolves. Everyone is dressed to the nines, heading out to the latest trendy bar, to be seen and talked about. 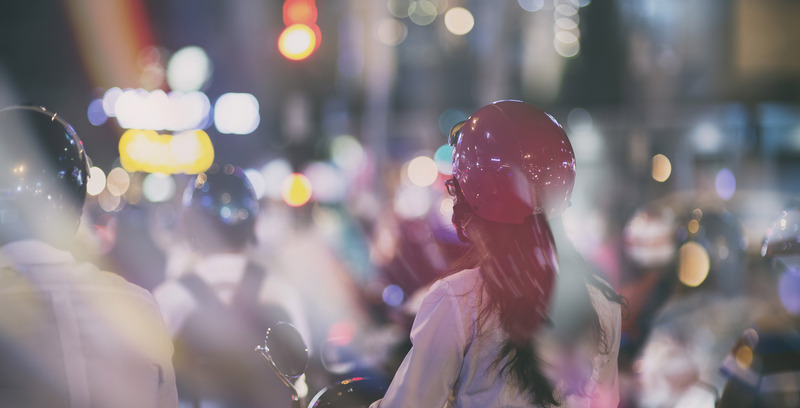 The motorbike at night has become a shaper of identity, status, clout, and desirability. The scene provides contrast with the average Vietnamese worker patiently waiting the red lights on their way home. Occasionally a speedster cuts through the traffic onto the sidewalk with a boom of his bike’s exhaust pipe. I’m surprised that the Fast and The Furious franchise hasn’t taken advantage of the motorbikes’ presence in Saigon and set at least one of its films here. Consider the possibilities for their filmed races. There are human pedestrians to avoid, street vendors that bikes or cars can crash into, obstacles like coconuts, flowers, and small plastic chairs. But for most in this crazy city of Ho Chi Minh City, the motorbike is the only way to get around. For many, it’s all about watching the countdown drop from six, five, four, three… and with a furious roar, we are off! Who can obey the rules of traffic and wait for the final count to zero?